Squarespace Review 2017 – Is it Still a Winner? Squarespace is a popular online website creation tool that was founded in 2004. Since then, it has been used to create over a million websites, including some from major international designers and businesses. This is likely because Squarespace is one of the hippest and most stylish platforms around, with powerful capabilities and features, as well as a big selection of sharp and modern templates. Squarespace is a generally well-reviewed website builder platform, but how much of that is hype? We signed up to find out. 1. Amazing Template Quality. 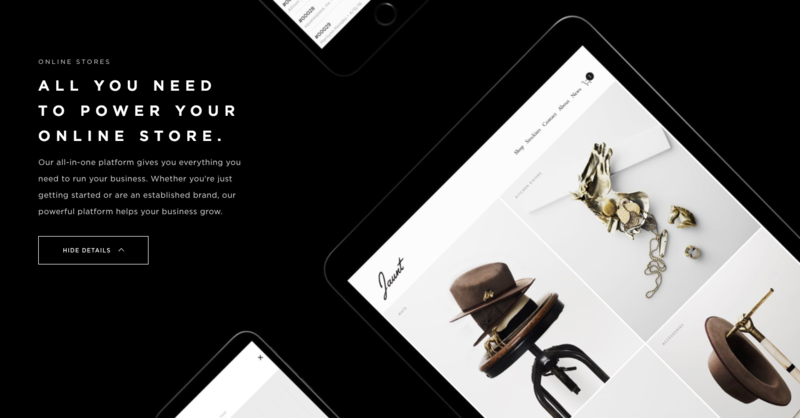 Squarespace has a strong collection of templates that will appeal to modern sensibilities. Their modern, minimalist, and clean designs are aesthetic and professional. While they are not necessarily as unique as they once were, they are representative of what the average Squarespace user – and internet user for that matter – is looking for. 2. Template Options Depth. Every theme offers full customization. Squarespace makes changing theme colors, fonts, and other features simple with easy to navigate menus. Premium packages even more personalization features, including the ability to change your site favicon. 3. Excellent eCommerce Platform. If you plan on using Squarespace to create an online web store, then you’re going to be pleased with all the eCommerce features offered by the service. You can set up custom predefined emails, set taxes for different countries, manage your inventory, create coupons, and easily manage inventory. 1. No Free Account Option. While Squarespace offers users a free account option, the site will only be available during a 14-day trial period. If you want to continue using Squarespace after those two weeks you will have to upgrade to a premium packages. 2. The Builder Is Too Complex For Beginners. Squarespace will have a steep learning curve for people who have never built websites. The platform is much less straightforward than competing products like Wix, which is decidedly the most user-friendly builder available. 3. The Editor is Not WYSWIG. One reason for the difficulty in using Squarespace when compared with other site builders is the lack of a What You See Is What You Get platform. WYSIWYG refers to an editor that allows the user to see what the finished product will look like as they are creating it. For the more advanced users, the fact that the live preview is on a different screen from the builder is going to be a good thing. It is faster to edit pages on a builder tool which is entirely dedicated to fixing and editing pages. Signing up for Squarespace is simple and getting started takes only a few steps. Using the editing interface is a different story, however. Similar to the sites you can create using Squarespace, the editor is minimalist and elegant. It, unfortunately, is not the most intuitive, however. Users who have never used the platform before may be confused about how exactly each tool functions, but they have certainly improved the usability over the years. Squarespace offers users a starter layout, which allows you to make edits to “ready” sample pages including About and Contact. Squarespace offers a great variety of different modules that you can add to your site. From the basics like text, photos, and videos to all of the widgets you could ask for including Instagram, Soundcloud, maps, menus, calendars, and embedded content. Modules are edited by double clicking them. A box will pop up with all kinds of settings for the module enabling you to easily perform actions like editing photo tags and adding custom text to specific fields. Squarespace doesn’t automatically save your work so you will have to make sure to do so after every editing session. 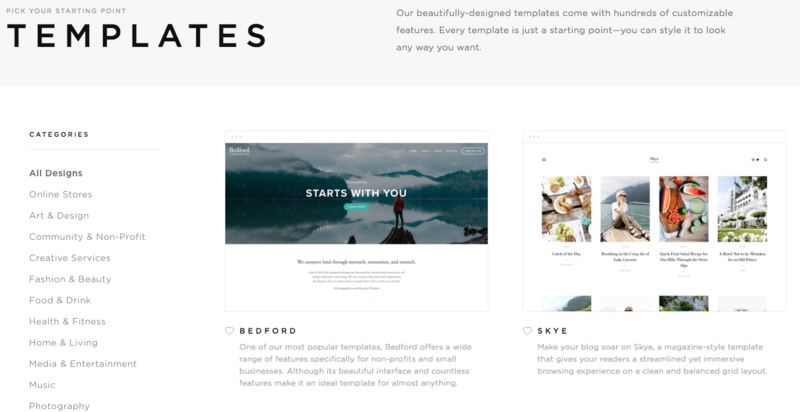 Squarespace offers fewer than 60 templates – not an impressive number. Compared to services like Wix and Webs, Squarespace has always lagged in that department. What Squarespace excels at is the quality of the themes. It is probably safe to say that all of them are exquisitely and professionally designed. They also have a distinguishable feel and look. Other builders have more options, but many of them are, frankly, terrible. Changing themes on Squarespace requires a similar approach to the way it is done on WordPress. You don’t get to just choose a theme and use it on your website. You install it and then you see a live preview of the theme. Only after you see the live preview of the theme will you be able to activate the theme. Themes are categorized by subject, including Art & Design, Fashion & Beauty, Home & Living, Music, and Photography. Just because a theme is labeled as Business doesn’t mean that it can’t be used as a blog. It just won’t perform as well as a dedicated blog template. Squarespace is a highly visual platform. This is very apparent from the templates they offer. To that end, Squarespace integrates Adobe Aviary photo editing for your images. Aviary allows users to enhance photos using effects and manual adjustments like Brightness, Contrast, Highlights, Vibrance, Tint, Exposure, and more – all within the Squarespace platform. The platform also integrates with Getty Images, allowing you to purchase professional stock photos. Unfortunately, these purchased images are not saved in a repository for use elsewhere on your site. Gallery appearance cannot be modified, but you will be able to choose how they are presented. Some options are slideshows, carousels, and grids. Unlike many of the other website creation services, Squarespace also has a mini content management system. With other popular website builders you have no direct management over the articles in your blog. They often just appear as single text fields. Each Squarespace blog page acts as a content management system (CMS). The CMS allows you to see a list of all of the blog posts that are on the selected blog page. In fact you can have multiple blog pages on your website. If you’re running an informational website, these blog pages can be used for different categories. This allows much easier management of large quantities of articles. From the blog page screen you can easily edit the settings for every blog post and you can edit the settings for the blog page. NOTE: If you are looking for different website builder solutions you might want to try Wix or Weebly, which are the main competitors to Squarespace. We really were impressed by the eCommerce solution that Squarespace provides its users. Their online store platform is very flexible and you can easily control and alter it at any time. If you’ve just started using Squarespace, when you visit the eCommerce settings page you will see a Getting Started tab. This will provide a list of the things you need to do before you can launch your online store. Squarespace allows users to list unlimited products on their site. Does your product come in different colors and/or sizes? Variants and different product SKUs can be added with ease. Merchandise can be organized and categorized, and release scheduling is also possible. This enables users to add products and have them show up only when they want them to be seen by shoppers. The eCommerce platform also has several other features including discount coupons, shipping settings, tax settings, an inventory manager, and an accounting tab where you keep track of income and other important numbers. As for payments, Squarespace is very flexible. The platform accepts all major credit cards, PayPal, and even Apple Pay. Squarespace automatically generates a mobile site based on your desktop site design. In exchange for more limited website layout customization options, users are rewarded with a site that looks great on mobile every time. This may be a tradeoff that is difficult to swallow for some, but we liked it because often times website builders are not effective at translating a site design for mobile. This is not the case with Squarespace, which offers mobile sites that look good every time. One feature you can edit is the mobile site menu. You can choose what appears on the bar, including options to display contact details and business hours. If you like Squarespace, you will most likely sign up for a premium account, considering the trial period only lasts 14 days. Squarespace offers four different subscription plans in two categories: Websites and Online Stores. The personal website plan costs $12 per month and the business website plan is priced at $18. If you are looking at opening an eCommerce site, we recommend skipping the Websites category and purchasing a plan from the Online Stores section. The basic online store plan costs $26 per month and the advanced online store plan, which comes with every feature you need to begin selling from day one, costs $40 per month. The pricing model is a bit more expensive than the ones of their counterparts, but Squarespace is aimed at a most high-end clientele. If you’re just starting out and you’ve never used tools like this before, you’re going to have to do some reading before the platform really lets you fly. This might be frustrating if you’re looking to start building your website immediately, but once you learn how to use it, it will prove to be a very powerful tool. And if you need it Squarespace support is just a click away. As a bonus to our readers, Squarespace is offering a 10% coupon code by visiting this link.